Good news!! There was a Tatzelwurm in Skin Deep. So pretty much all the European dragon from all types is extinct? Ia that mean that lindworms and wyverns are out of the question? 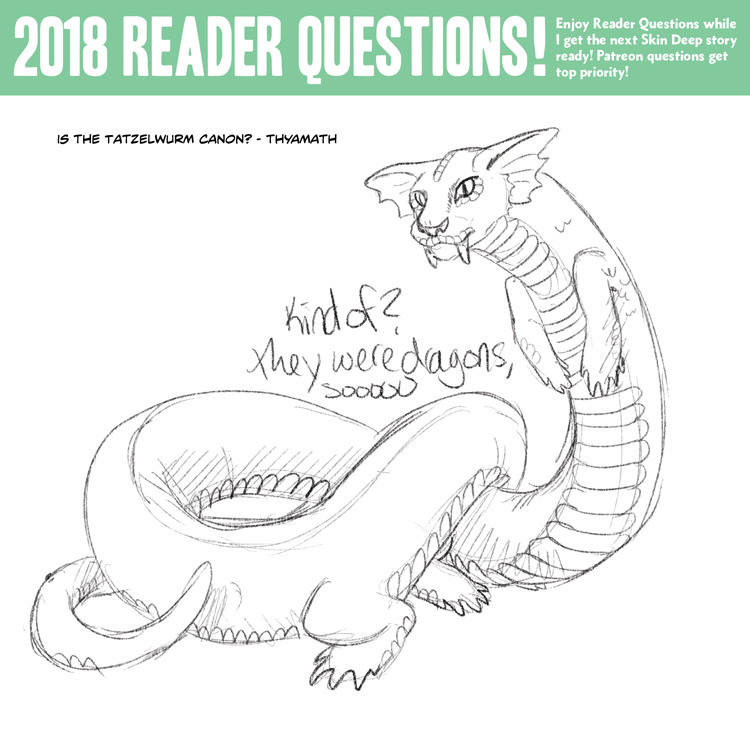 Considering what Kory says about the Tatzelwurm, I reckon I’d have to say Yes to both lindworms and wyverns being extinct. I just had a thought, what are feelings of the mythic community on My Little Pony: Friendship is Magic? I’m sure some individuals from several demographics will have choice words. I’m especially sure Mr. Hyde will have some choice words on their representation of the Bugbear. That said, after a little research on my end, I found that bugbears in a fantasy setting being some sort of goblin aren’t far off, in some European lore the bugbear is basically an evolved or ranked up version of a malicious hobgoblin. Hobgoblins, commonly shortened to just Hobs, are an interesting case in terms of lore. While your standard goblin is mischievous, destructively so if not satiated with some sort of treat, the hobgoblin works a little differently. From what I’ve managed to uncover, Hobgoblin means “goblin of the hearth” and they actually serve as, usually, unseen caretakers for a house; they’re also referred to as “naked elves” due to their aversion to wearing clothes, they actually consider the offer of articles of clothing so insulting that if they are offered clothes they just up and leave, that said, if you fail to leave out something like a bowl of cream for them every few nights they go from unseen helper to a malicious wrecker of your home until either forced or satiated with a more substantial treat for services rendered. Actually, I think it would be interesting more if Alec Hyde to meet a brownie (pronounced Broo-Nee), seeing as brownies are described as mischievous fey in Irish lore. Funny thing about brownies, if you manage to catch one it is said they will “serve you for life as a housekeeper” and I think it would just absolutely hilarious to see Alec Hyde being pranked by a faerie known for being a trickster that is notoriously difficult to catch. There would probably be a few back and forth goodnatured pranks on one another but it would seem to go nowhere with both parties failing to actually catch the other. On that note, not many fey have been addressed in Skindeep, not even a handwave of them being rare among the mythic community. Skindeep is set in 2004ish, so MLP:FIM is gonna be a while before anyone from this universe will be exposed to it. Especially at the pace the comic moves time. It might be 2034 out time before 9/11 and all its intercontinental travel hardships becomes the new vogue for our characters. She answered this question already (sort of). How many European dragons, witnessing the hunting of their brethren to extinction, tried to flee to Asia and pass off as an Eastern dragon? How do genetics work for being a mythical creature? If a grandfather was say a Gryphon and he had a human daughter and she had a baby with another human, would it be at all possible for his granddaughter to be a Gryphon or would that child have a 100% chance of being human? To simplify is the monster trait only passed on by parents? Kind of a weird question, but what do you think the Gargoyles from Gargoyles would look like if they got Nixie Spitified? if i remember correctly, in your comic lewis carroll based his book off wonderland after somehow finding its entrance. if i remembered that correctly how much of what he wrote true? like is there (or was) and actual queen who had a penchant for decapitation?